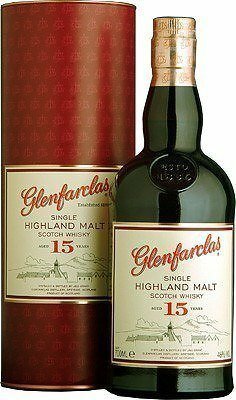 Glenfarclas 15 Years Old 46% Vol. Colour: A rich golden amber. Nose: Complex, sherried, deliciously peated, light butterscotch aromas, with a hint of dried fruit. Flavour: Full bodied with super balance of sherried sweetness, malty tones and peaty flavours. Finish: Long lasting, gloriously sherried, sweet, gently smoky, and distinguished. Comment: With greater complexity than our younger whiskies, this is a great whisky drinker’s whisky. We bottle this at 46% simply because my grandfather preferred it at this strength. It’s still a family favourite.